DesMoines Iowa June 29th 1869 Dear Col We supposed that some time through the summer we might heer from the children but nothing until this morning. 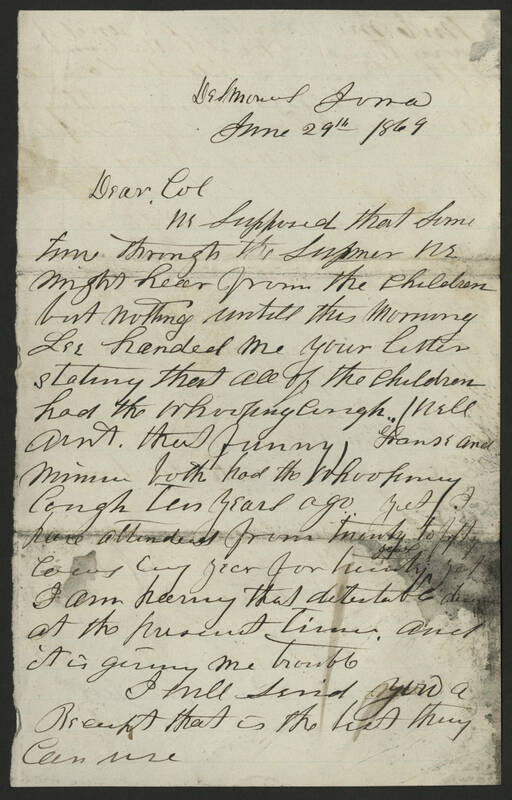 Lee handed me your letter stating that all of the children had the whooping couth. Well arnt that funny. Hank and Minnie both had the whooping cough ten years ago. Yet I have attended from twenty to fifty cows every year for twenty years, yet I am heering that detestable disease at the present time and it is giving me trouble. I will send you a receipt that is the best they can use.